Listening to Family Caregivers — What Matters Most? Social Work Today spoke to several family caregivers about their physical, emotional, and financial needs and how professionals can better support them. Robin King already was the primary caregiver for her mother when her husband, Marshall, suffered a heart attack on the Edmond, OK, couple’s anniversary. He had just handed his wife flowers and a card and kissed her on the cheek when he went into full cardiac arrest. After he was taken to the hospital and put into a medically induced coma, the doctors told Robin King her husband probably would not wake up—and if he did, he’d be brain damaged. But Marshall King beat the odds. He woke up talking and with his cognitive functions intact. But Robin King says her husband was in poor health because of the heart attack, and his condition continued to deteriorate. Not long after his heart attack, Marshall King was diagnosed with pancreatic cancer. Robin King’s mother had passed away by this point, but Robin King was once again thrust into the role of full-time caregiver. The round-the-clock caregiving for her husband often proved isolating and exhausting for Robin King and though she received support from home healthcare and hospice, she says she could have used support from a social worker. According to the National Alliance for Caregiving, in collaboration with AARP, it’s estimated that more than 65 million people—29% of the U.S. population—provide care for a chronically ill, disabled, or aged family member or friend during any given year and spend an average of 20 hours per week providing that care; 13% of family caregivers provide at least 40 hours of care per week. Yet there is growing evidence that many family caregivers are not getting the support they need to thrive. The burdens on today’s family caregivers are heavy. A recent study conducted by the National Family Caregivers Association (NFCA), in conjunction with Allsup, Inc. (a nationwide provider of Social Security Disability Insurance representation and Medicare plan selection services), found that taking care of their own personal health, lack of respite care, and meeting monthly financial needs were the top concerns cited by the 1,579 family caregivers surveyed. P. J. Jordan, who cared for her husband following a rhinectomy (full removal of the nose) due to nasal cancer, experienced caregiver burnout and developed shingles as a result. When her husband, Mel, returned home following surgery, she was suddenly thrust into the role of full-time caregiver, which included medical responsibilities such as keeping his nasal cavity clean and handling regular bandaging. Feelings of isolation are a common concern for family caregivers. In fact, 75% of survey respondents say they struggle with it. For Robin King, the isolation significantly impacted her. She says her husband was a strong and proud man who didn’t want his friends and family members to see him in poor condition. As a result, Robin King was often isolated as well. Mintz, who is also the full-time caregiver to her husband, who was diagnosed with multiple sclerosis in 1974, says isolation is common for caregivers. They often think no one understands what they’re going through, that no one else can relate to their experience. The NFCA/Allsup survey found that caregivers were very to somewhat concerned about several financial issues. Meeting monthly financial needs was a top financial concern, with 77% of respondents admitting it was a worry. Seventy-one percent also said they were concerned about the lack of paid home health support, and more than one-half were worried about their current employment situation and having adequate health insurance for themselves. On top of personal financial concerns, many caregivers are suddenly thrust into the role of handling their loved one’s finances as well. Financial resources and planning are important tools for social workers to share with caregivers—even just tips on better budgeting or food shopping. But Gada says social workers must remember there’s an emotional element that goes beyond the mechanics of financial planning: the fact that it’s uncomfortable for both the caregiver and the loved one to be in this situation. — Lindsey Getz is a freelance writer based in Royersford, PA, and is a frequent contributor to Social Work Today. In researching this piece on caregiving, it quickly became evident that finding a male caregiver to share his story was a challenge. 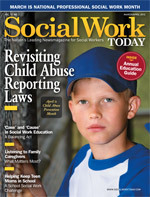 Social Work Today suspected it wasn’t because they weren’t out there, and that something else must be at play. So we turned to Lenard Kaye, DSW, PhD, a professor of social work at the University of Maine School of Social Work and director of the University of Maine Center on Aging, who has researched male caregivers.